Do you think about “be forgetting” ? This year is the fifth time of Yokohama triennale as the triennale international art exhibition of the modern art. About 400 art works of 79 artists gather around Yokohama. Developing this exhibition at Yokohama Museum of Art and Shinko pier Exhibition hall, the title is “ART Fahrenheit 451:Sailing into the sea of oblivion”.This long title is derived from Bradbury’s science fiction novel, “Fahrenheit 451”. The story is about books buring in the near-future where people are forbidden to possess and read books. You will look to the opportunity to remember a huge number of “lost and found”. First after entering Yokohama Museum of Art, Michael Landy’s , which is located in the center of the entrance hall, catches your eyes. It’s a huge “garbage box for arts”. Failed works of artists or past pieces that they want to throw away are thrown into a garbage box. What if a garbage box is set in the center of world once? You must see your special things lost behind more than usual. “Moe Nai Ko To Ba” is created as an homage to Ray Bradbury’s novel “Fahrenheit 451”, that is “The Only Book in the World”. It is a collection of 8 texts of various languages, featuring the theme about “oblivion”. During the exhibition, visitors can be free to access this book and it has a reading performance irregularly. Hayashi Goh and Nakatsuka Hiroko’s “Court” series, presented at the Kyoto Independents exhibition in 1983-1985, consist of three models (patterns, examples) by a courtroom, tennis court and jail and five (deliberations, vessels). Red court, green tennis court, and blue jail. Mirrors are used in art works, reflect yourself and become integrated. Changing a phase to see and talk, it tries to relocate them into today’s subject such as body, territory, health and safety. Second venue, Shinko pier Exhibition hall is also a hot place. 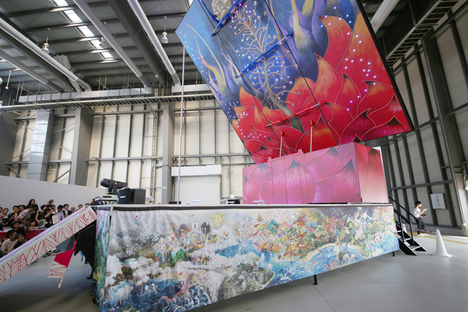 Yanagi Miwa’s mobile stage truck for the play, created in Taiwan, is displayed for the first time. A new play (orignal: Nakagami Kenji) is going to be performed at a mobile stage truck. In a private view, a pole dance was performed specially. A play is going to participate in Parasophia in Kyoto, 2015. Tsuchida Hiromi is a photographer who captures Japanese culture and manners from his unique perspectives. In triennale, it displays a series of theme “Hiroshima” as his lifetime work. “Hiroshima, 1945-1979/2005” follows children in postwar years who wrote their experiences of atomic bomb for “Children of Hiroshima”, Osada Arata. In front of his message and pictures recalling the past vividly, you can see the landscape about exposure to radiations. It makes you think the scars of wars at the same time. It seems that photographs appeal to people nowadays in order not to miss important things forever, while warning about forgetting memories of tragedy. “I would like to send a message about ‘what a truly good art is’ from Yokohama”, said Morimura. Through art works, it could feel a strong feeling exactly as he stated. You must come to see, touch and feel it. Let us sail into the sea of oblivion.